In 1730 AD, the South Indian Kingdom of Ramnad (modern day Tamil Nadu), welcomed the birth of a new heir to the throne. From a young age, this royal child was trained in martial arts, horse riding, and archery; and taught to be proficient in Tamil, English, French, and Urdu. Mannar Sellamuthu Sethupathy and Rani Sakandhimuthal spared no expense in ensuring that the new heir would be given all of the skills of a competent warrior; little did they know that their successor, ‘Veera Mangai’ Velu Nachiyar, would one day become the first revolutionary to successfully oppose the British rule of Tamil Nadu. At 16, Velu Nachiyar was married into the Royal family of Sivagangai, to Muthuvaduganathaperiya Udayathevar. Velu Nachiyar and daughter, Vellachi Nachiyar, were forced to flee into exile following the death of Udayathevar and his second wife during a battle against the British. Over a period of eight years, Velu Nachiyar amassed an army and sought out powerful allies in Gopala Nayaker and Haider Ali. In 1780, Velu Nachiyar successfully fought and overturned the British rule in Sivagangai. Rani Velu Nachiyar ruled her regained kingdom for ten years, after which she turned the rein of the Sivagangai kingdom to her allies – the Maruthu brothers. The Rani died some time later, circa 1790. Rani Velu Nachiyar was the first ever female warrior to challenge the British Empire in the Indian War of Independence. As such, she redefined the role of women within the Indian freedom fighting revolution. With the majority of men at the time behind bars, she mobilized a women’s artillery. This army was named Udayaal in honour of the Rani’s adopted daughter, who died after detonating a British arsenal. Veluni Nachiyar is also credited to have created the first human suicide attack: Kuyili, a female soldier, doused herself in oil, entered a British-owned ammunitions storage, and destroyed the facility by self-immolation. 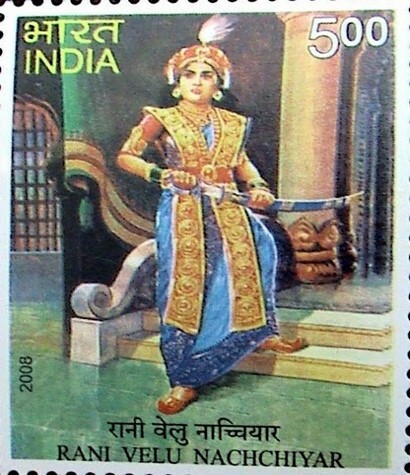 On December 31st, 2008, the Indian Postal Service released a commemorative postage stamp to pay tribute to the great valour exhibited by Rani ‘Veera Mangai’ Velu Nachiyar. She holds the distinction of being the first queen to victoriously reclaim a kingdom from British rule in India, and is thus referred to by some scholars as the ‘Joan of Arc of India’. Nevetha Yogarajah is an active chemist, working towards obtaining her Masters degree in Environmental Applied Science. 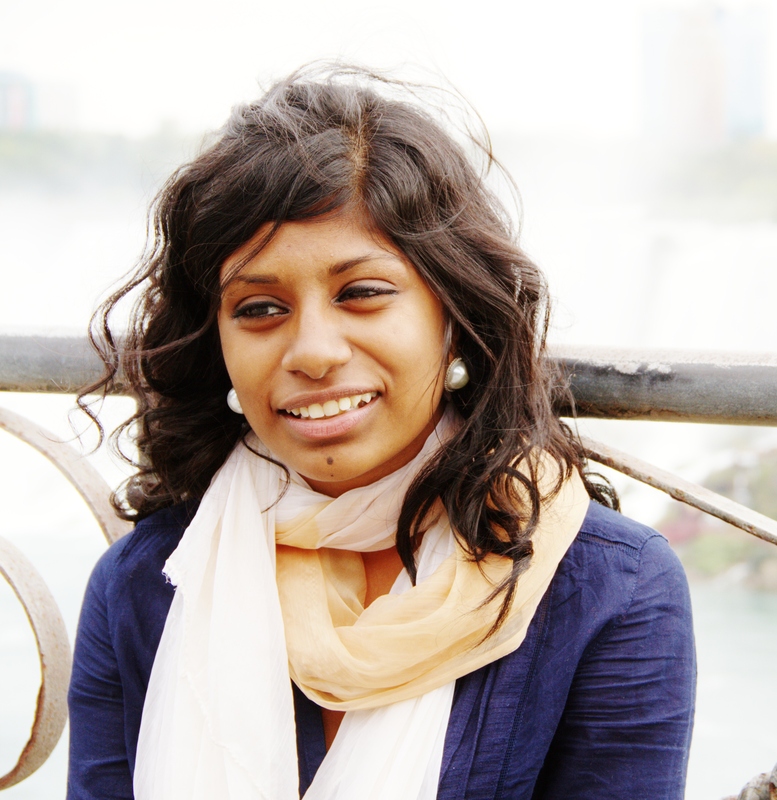 A certified coffee-holic, Nevetha may be short in height but she’s never short in energy! This entry was posted on Thursday, February 26th, 2015 at 12:31 am	and is filed under History & Culture. You can follow any responses to this entry through the RSS 2.0 feed. You can leave a response, or trackback from your own site.